We are a small, innovative and independent community development organisation based in Australia. Community led and volunteer based, we look at development differently – we commit ourselves to long term respectful partnerships and use an approach which values community ownership, sustainability, transparency and equity. Our Budaka project in Eastern Uganda supports the education, well-being and social inclusion of orphans and vulnerable children impacted by HIV. We support the health and wellbeing of women and children in Rote, Indonesia through targeted education and food security programs. We work with refugee communities in Australia to support education and empowerment programs in Jirghai in Afghanistan and Wedweil in South Sudan. In May 2017, we had the privilege of cohosting a visit to Australia by Dr Sima Samar, the Chair of the Afghan Independent Human Rights Commission, Nobel Prize nominee and first Afghan Minister for Women. Watch this video of indigo foundation Chair Sally Stevenson in conversation with Dr Samar in Sydney. To celebrate over 15 years of partnership with Lua Lemba in the arid remote island of Rote, Indonesia, we made this video to mark the impact of the program across health, education, women’s empowerment and culture. Nasima Rahmani, Director of our longterm partner in Kabul, the Women’s Empowerment Centre, was interviewed by Patricia Karvelas on ABC RN Drive program about the advances made – and threats looming – for women in Afghanistan. Please join us for a very special evening at our annual Sydney dinner on 30 March 2019 as we celebrate 15 years of partnership in Afghanistan. MC’d by the wonderful Verity Firth and with Ali Reza Yunespour as guest speaker reflecting on the incredible impact that the Borjegai and Jirghai community has made to rebuild education opportunities in his home region. Are you keen to take on a riding challenge, make friends and raise funds for indigo foundation at the same time? Our friends at the Billberry Bluestocking Foundation are again riding from sea level at Nowra, via Canberra to the summit of Mt Kosciuszko. The ride this year is from 21 – 26 March. Join them! 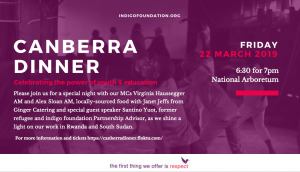 Our annual Canberra dinner is on again – 22 March 2019! Please join us for a night of fun and friendship, fine dining and entertainment as the sun sets over Canberra. With double-act MCs Virginia Haussegger AM and Alex Sloan AM and a special guest speaker in Santino Yuot, we’ll celebrate the important work our community partners are doing in Rwanda and South Sudan to empower young people, improve education outcomes and unleash the power of youth leadership.